October 25, 2013 | Posted by Lee C.
Bedskirts, which can also be called dust ruffles, are a very useful piece of bedroom decor. They add a more formal touch to your bedroom’s focal piece, but they have function as well. Bedskirts are placed under your mattress and hang down around the box spring and bed frame. The hem of the bedskirt typically meets the floor, covering the metal bars and legs of the frame. Bedskirts are also called dust ruffles because one of the functions of a dust ruffle is to prohibit dust from collecting under your bed. In addition to blocking dust, bedskirts make it easy to use space under the bed for storage. A bedskirt will help hide unsightly storage boxes. Bedskirts are usually available in two styles; ruffled or tailored. The ruffled skirt has a gathered ruffle that goes all they way around the bed. The tailored skirts are straight with occasional pleat giving a more box like appearance to the bed. Bedskirts can be found in prints or patterns that match or accent your comforter and other bedroom decor. Bedskirts are also often crafted from attractive lace. When you are buying your bedskirt you will want to make sure the bedskirt is the right size. It will not hang evenly or lay attractively around the bed if it is not an exact fit. About.com Interior Decorating suggests that even if you know your bed size, measure the length and width anyway because even standard sizes can vary every now and then. After you know the length and width you will want to measure the drop. The drop is the distance from the top of the box spring to the floor. If your measurements vary at all from the standard sizes, you may want to order a custom bedskirt. That way you will know it will look exactly right on your bed and the skirt will reach all the way to the floor without dragging. Bedskirts are an excellent way to keep your bedroom looking neat and well put together. Use a bedskirt to add a little flair to your decor or simply blend in with a matching solid color. You bed is often the focal point of the bedroom and your bedding set is not complete without a bedskirt. Find a great bedskirt that fits well to give your room a finished and attractive look! October 22, 2013 | Posted by Lee C.
Comforters can be large, heavy and difficult to clean. Unfortunately, the need to wash a comforter does comes every now and then. Here are a few tips to help you get your comforter clean without causing too much wear and damage to your comforter or your washing machine. If you are going to wash your comforter in a machine at home, you must have a large capacity machine and possibly a front loader. A post from Home Ec 101 informs that because comforters can soak up so much water they can damage the motor of a top loading washing machine. The damage is likely to happen over time and different washing machines will be able to handle different amounts of wear and tear, but you probably don’t want to experiment with your own washing machine. Instead of washing the comforter at home, take it to a local laundromat. It will have high capacity machines that will have no difficulty handling cleaning a comforter. Use a delicate setting and wash the comforter on cold or warm, but not hot. To dry the comforter use a low heat setting. RealSimple suggests putting in a few new, clean tennis balls in the dryer with your comforter to help fluff the filling. The dryer can also be tough on your comforter causing some wear and tear. If you have plenty of time and space, you can hang your comforter to dry instead. This will help your comforter last longer, especially if you need to wash it often. Some comforters that are down or synthetic alternatives to down require dry cleaning. Be sure to follow the care instructions carefully and take your comforter to the dry cleaners when necessary. A small bill at the dry cleaners is cheaper than replacing your comforter or washing machine. To avoid putting wear and tear on your comforter use a duvet cover. Duvet covers slip on over your comforter and are easy to wash in your home machine. You will not have to wash your comforter as often and as a result you can extend its life. Taking proper care of your comforter will help it stay fluffy and cozy for a long time. Try not to wash it too often, but when you must follow the care instructions carefully. 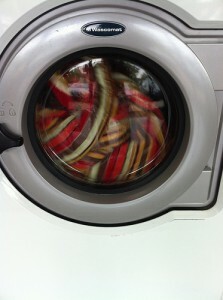 Photo “Laundromat Day” courtesy of Celeste Lindell. October 19, 2013 | Posted by Kay T.
As winter approaches, adding an extra layer of warmth to your bed can help you sleep better at night. With a blanket to accompany your comforter you can save energy by turning the heat down while you sleep and still stay comfortable. You need to start by finding a blanket that is the appropriate size for your bed. Measure your bed so you can be sure to have an exact fit. Next decide what type of material you would like. Blankets come in down, cotton, polyester, wool and more. Some factors that you may want to consider when choosing your blanket are allergy concerns, ease of washing, and softness. Cotton blankets have withstood the test of time for many generations with its softness, warmth and breathability. Cotton will naturally shrink, but shrinkage should be minimal and limited to the first couple of washings. A cotton blanket will also become softer over time with repeated washings. Using an organic cotton blanket will ensure that the blanket is free of chemicals. This can be an ideal blanket for people with sensitive skin. Down blankets are lighter in weight than down comforters. They can be used in addition to comforters or on their own. They offer comfortable light weight, yet warm insulation. If you suffer from allergies you may want to be careful of down. They can often collect allergens and are a bit more difficult to wash than cotton blankets. A hypo-allergenic down blanket, is a great alternative if you are concerned about allergies. Polyester is a man-made fiber and typically less expensive than cotton. 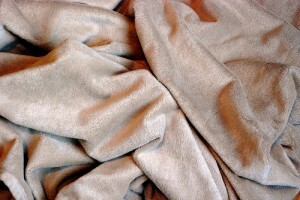 Polyester blankets are usually not as soft as cotton, but are warm and durable. Whether they are 100% polyester or a blend with other fibers, they can withstand many washings and hold up well. If you suffer with allergies, a blanket containing polyester may be an ideal choice since it can be washed regularly in hot temperatures to ward off dust mites and other allergens. Choosing the right blanket for your bed can help to ensure a better nights sleep, although it may make it harder to get out of a warm bed in the morning. Make an informed choice when buying a blanket by determining what criteria are most important to you; softness, durability, warmth, ease of care, or absence of dyes or chemicals. Taking your time finding a blanket you love will help keep you comfortable and warm for many nights to come.